iTunes has historically made sharing music with friends something of a hassle. It's not impossible, but it's not a "Just Works" scenario. It does, however, make it ridiculously simple to erase your friend's iPod, but I wouldn't call that a feature. The advent of library sharing on a local network did allow for some semblance of communal music, albeit within fairly strict confines. However, a variety of solutions exist for achieving a more social level in your audio pursuits. iPod users quickly realize that the first step is to achieve bi-directional transfer from their portable device to the computer. Several great utilities exist for augmenting iTunes' sync capabilities. We've mentioned Podworks before, and Senuti is a long-standing favorite. We've also covered iPod.iTunes, which recently underwent an update. Any of these tools can get your music from your iPod into iTunes, including your friends' iTunes, but I'll take the safe road and mention from the start that music sharing is for personal use only (which will seem increasingly ironic as you read on, but I'm sure you know the rules well enough that I don't need to elaborate). Sharing your audio files over wider network also requires some additional software. There's Simplify Media, which we highlighted last year. You've also got KavaTunes, a shareware app that makes a web page from your music collection that looks and acts just like iTunes. And now we've got Mojo. Mojo makes it simple to view, play and download music from other Mojo users. You control a buddy list, allowing only certain people to access your music. And the great part is that the standard version of Mojo is free. There's a PRO version – starting at $10.95 for 3 licenses – that adds playlist subscription, but the functionality of the free version is otherwise unlimited (reader Disconnect points out that the free version is limited to 3 Internet users, a fact I missed because I didn't add any more than that. Local network sharing is unlimited, for what it's worth). Mojo is fairly adept at automatically navigating many network configurations and multiple protocols, automatically detecting other Mojo users. A helper app runs in the background (optional) and provides a constant connection to your authorized friends. Your available Mojo friends appear in your buddy list, and you just select a connected buddy to browse the music they've made available using Mojo's (not bad-looking) interface. DRM songs display in red, and actions taken on them will offer to let you jump into iTunes to authorize your machine. It also detects songs that already exist in your iTunes collection and greys them out. They're still playable, but the option keeps you from downloading duplicates. Songs downloaded through the interface can be automatically added to iTunes, with several options for automatic organization. I set Mojo up on a remote server and made two users, just for fun. I uploaded a few songs and then streamed them back over the Mojo connection. It worked smoothly and I found myself considering relocating my collection to a server with enough storage and automatic backups. That would free up about half of my hard drive and make my songs accessible to any computer with Mojo installed. It might never happen, but I like the possibility ... and the idea of doing it for free. But, let's say you want to share your music with someone standing right next to you. 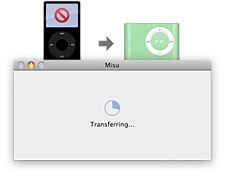 Obviously, the option exists to do some manual transferring of your collection from iPod to iTunes to another iPod, but there's an easier way on the horizon. Enter Misu, a new application from the developers of Menuet and Art Collector (covered previously). Misu, which just entered a beta period, offers an extremely simple interface (check out the visuals) for connecting multiple iPods, choosing a source from the detected devices, and melding the music collections together. It compares the libraries of the source and the target iPod(s) and figures out what songs are missing. Hitting the transfer button effectively synchronizes the collections. If there's more music than will fit, it will offer to stop when the target device is full. Misu doesn't offer any options for manual management. It also doesn't currently work with iPod touches, but that functionality is planned. The Misu beta isn't publicly available, but the developer is opening it up to TUAW readers. To limit the number of beta testers, the invitation will last for 24 hours, starting this morning. People who get in on the beta will also receive a licensed copy of the final product, free. If you've been looking for a program that fills the person-to-person iPod sharing void, grab the Misu beta and take it for a spin. The super-secret code you'll need is 48372. You'll want to set your iPods to disk mode, and you may want to disable the "Start iTunes when connected" option. Have fun with all that legal music sharing. Update: Misu is Leopard-only, a fact I obviously missed when getting my, um, facts. Apologies to Tiger-using readers who's hopes were dashed when they downloaded the beta.